Last week, I discussed my unusual high school job: pouring beeswax candles at a Greek Orthodox Convent! 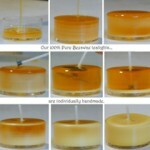 Read about the healing properties of beeswax candles and the dangers of paraffin candles here. Did you know, for example, that many people find burning beeswax candles an effective treatment for allergies? More than 90% of soy is genetically modified! GM soy crops are heavily sprayed with toxic pesticides, causing harm to both the harvesters and the soil. 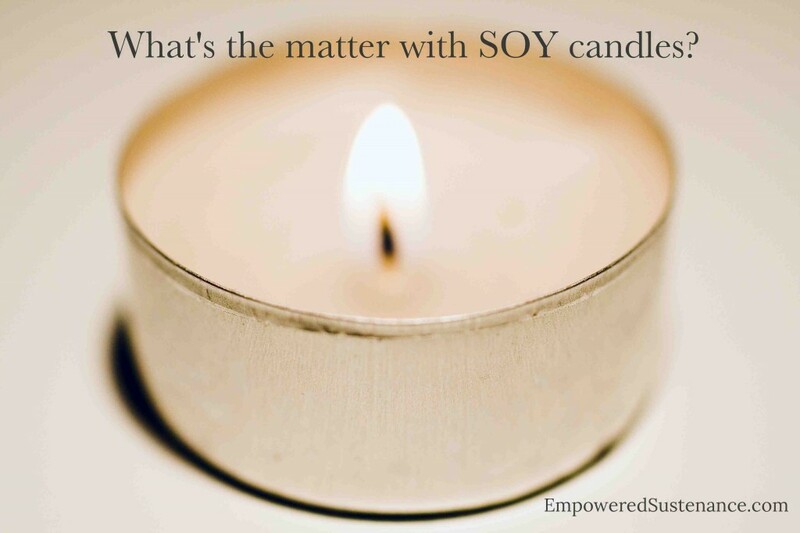 So if you are buying soy candles, chances are you are supporting the production of GMO’s–which devastate our environment and our health. When you buy paraffin candles, you are spending money to poison your home. Beeswax candles, like I discussed, are a healing investment and worth the higher price tag. Soy candles–even 100% pure soy candles–cost significantly less than beeswax. Those who want a more affordable alternative to paraffin often go with soy candles. Although this is a personal decision, but I would rather go candle-free than settle for anything less than 100% beeswax. Where do I get the beeswax candles? Please read the UPDATE section on my beeswax candles post. Questions about wicks or making your own candles? Please refer to that post, too. Something that is given by nature as gifts to humans don’t require me to have scientific proof. I don’t need science to tell me when I’m burning a candle if its doing bad or good to me..
Noone needs to show no one proof of anything, since their is alot of info and studies provided that paraffin and soy are bad for our health in candles. Lets look at the full picture to prevent disagreements. 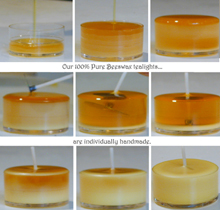 I found this site doing research into soy candles, as I have been using beeswax for a while to make my candles. I have very strong allergies, acute sense of smell, and very sensitive lungs. I also love candles. As a result, I started making beeswax candles. I have to say that I strongly agree with your (OP and Owner) with your “nutrition vs medicine” philosophy. Many massive companies care only about providing their product at the lowest possible cost, often not considering the long-term effects that their products have on their consumers. Likewise, many doctors are either incredibly lazy, incompetent, or in the purse of Big Pharma. Some people need medication. Many others take medication that they don’t need. However, good doctors do still exist, that will first try to prescribe good nutrition and exercise. And I think making blanket statements about groups or categories of people, is the first step to making an error. I wanted to point out in this comment that science and the scientific process are invaluable to the human condition. Without scientific inquiry, we would not know the melting point of beeswax, nor would the secrets of electronics and the internet exist–and thus, you would not be able to operate your blog, or make your candles safely. We would also have many more people suffering and dying every day due to treatable diseases that REQUIRE medication. I appreciate this post as it gave me some new questions to ask. So thank you for taking your time to write it. However, I will be unable to follow this blog because you started your comment with a back-handed criticism of people requiring scientific proof. I felt personally attacked by that criticism, as I don’t sell soy or paraffin candles. You said in your comment, “I love delivering good products to customers with benefits…” yet, how do you define good? And while I agree with your claim that beeswax is the best candle wax–specifically, in my opinion, for people with allergies and sensitive respiratory systems–your downplay of the importance of science in this question is disturbing to me. You’re not following the blog anymore because of a COMMENT? The author didn’t write the comment! If you choose your blogs based on the people who comment on them, you’ll have none to follow. We just launched our candle business and knew immediately we would do a combination of beeswax and coconut wax. Some of the reviews we gotten on our Facebook page have been amazing and continues to solidify our decision. We had one customer share with us that she had not burned candles in her home in 15 years do to allergies but our candles have been amazing for her with no adverse effects. It may cost more to produce with all natural oils but the brand value is second to none! Hi, what is the name of your candle company in case I ever want chemical free candles? Careful, dangerous dihydrogen monoxide is still used in the production of most equipment and materials! ♥️ We looked high and low for our Beeswax and we source it from Quebec, Canada. The purest Beeswax. Ebz: it seems you are unaware that many natural things can also be poisonous or cancer-causing. “Natural” does not necessarily mean it is healthier, and that is why we need scientific studies. What if you have a beeswax allergy? I was thinking soy? Do you have any recommendations? Thanks for this info! I was googling if soy candles were actually healthy or not. Regular candles, well, I am not buying them anymore but I LOVE the ambiance and smell, even though they gave me headaches (thus not buying them). I would switch to beeswax for sure, and hopefully I can find a local provider here in Montana (we do have local honey here). One question: Can you provide a link to the statement about purity being 51% even for food? That is powerful information, but only if supported by proof – I can’t share it with skeptical friends unless I can back it up. TIA!